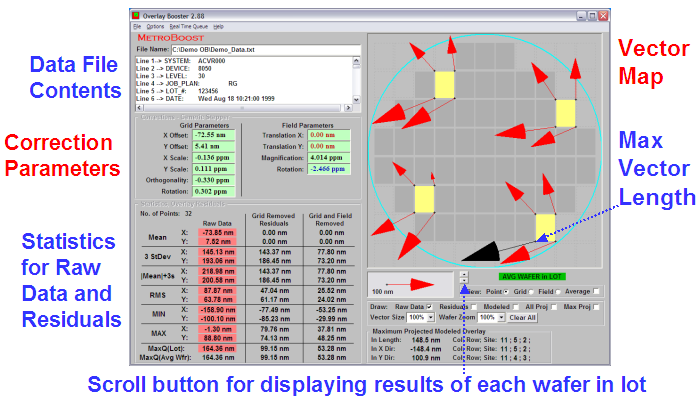 Overlay Booster is a Windows-based analysis software for stepper and scanner control in production. As input, Overlay Booster takes data files generated by overlay metrology tools such as IVS, Accent or KLA. It then performs model specific analysis and provides feedback parameters for steppers and scanners to achieve tightest overlay on product wafers. At the same time, it also produces raw data and residuals statistics for decision making and lot disposition in production. The maximum predicted modeled error is available for display and output as a user selectable option. All the information the user needs, including vector map and lot or wafer statistics, is displayed on a single screen. For off-line analysis, Overlay Booster can operate in two different modes: Standard and Advanced. In standard mode, the analysis method is always single-pass optimization. In advanced mode, user can input other transformation commands. In addition to the above capabilities, features below are available and separately licensed. Stepper Matching - You can find the best match for a specific stepper among a group of steppers. The method relies on data files from stepper calibration/monitoring wafers. The method uses the capability to subtract data files. A new feature has been added to allow saving of lens fingerprint as an overlay data file. This lens fingerprint file conversion feature is also available in multiple file (batch) mode. Correction offsets for initial exposure as well as estimates of residual error are also provided. You can find the best match based on either calibration files (whole wafer results) or lens fingerprint files (matching of intrafield residuals only). Database - Overlay Booster can export the analysis results in real-time mode to a database. Database application makes it much easier to obtain trend information about overall manufacturing line performance for specific devices or layers or exposure tools. Separately, a utility is provided to leverage the existing files stored by IVS tools by analyzing them and exporting the results to that database. This leads to a substantial benefit to the customers by providing them with the ability to add the database the results for lot measurements collected in the prior months.